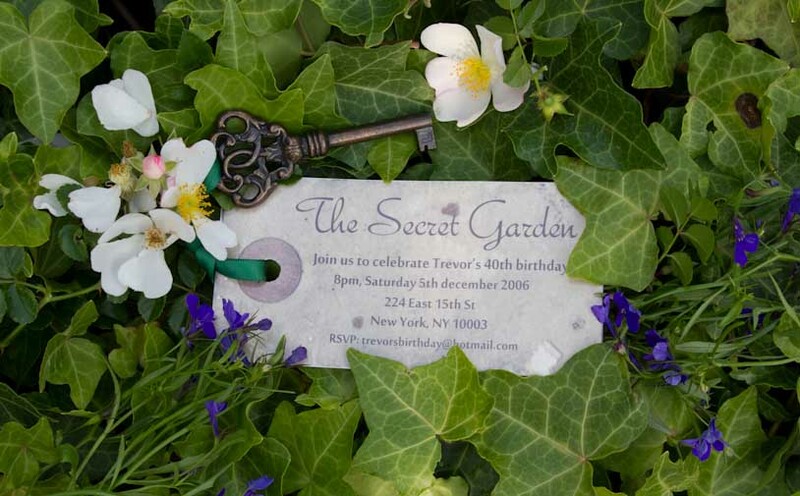 For unique garden party ideas, perhaps to make an adult birthday dinner a bit more special, you can apply a Secret Garden theme. Loosely inspired by the classic children's novel, the name alone is wonderfully evocative. 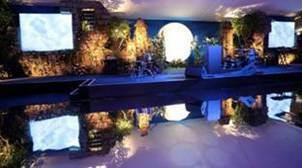 Implying a sense of discovery, it has mysterious, romantic and enchanting connotations. If you're planning a kid's birthday party you might prefer to adapt some of these garden party ideas and call it a Woodland Fairy theme by including fairies, sprites, butterflies, and ladybugs. 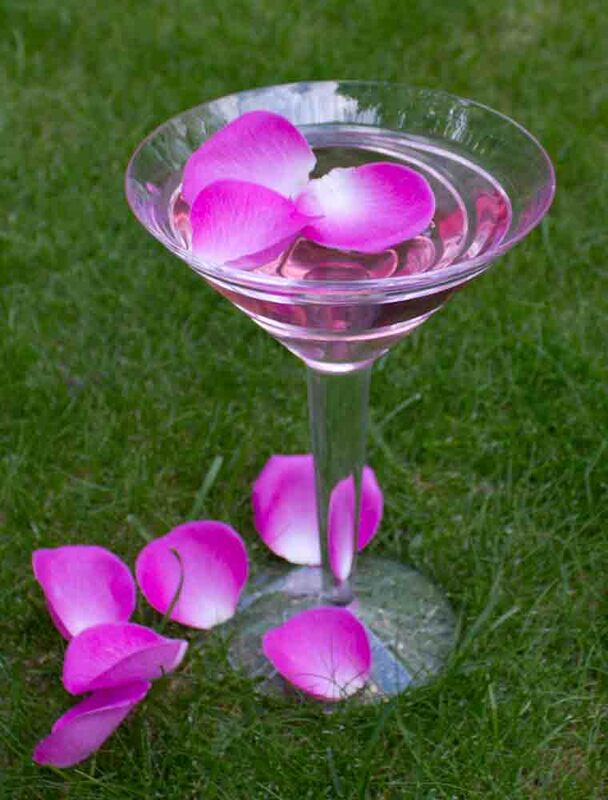 Or you can apply these garden party ideas to a tea party - check out my Alice in Wonderland party page for more tea party ideas. 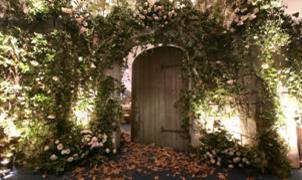 A Secret Garden party theme is very versatile and can be adapted to suit all different occasions. It's sophisticated enough to be used for an adult birthday or it can be applied in a more subtle way to an everyday cook-out such as an alternative to a BBQ. 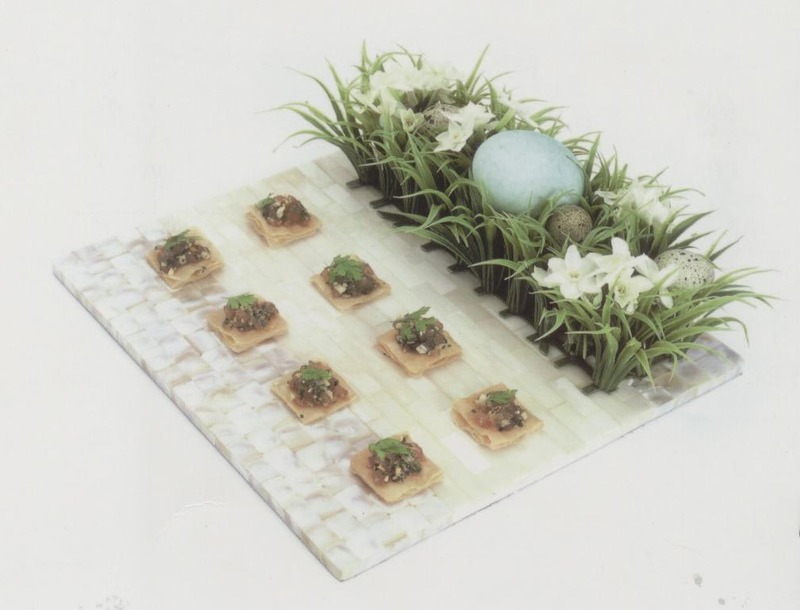 The garden party ideas below are inspired by the rustic beauty of an English country garden and incorporate all the wonderful flavours and smells of herbs, fruits, vegetables and flowers into the food and drink, table styling and decorations. 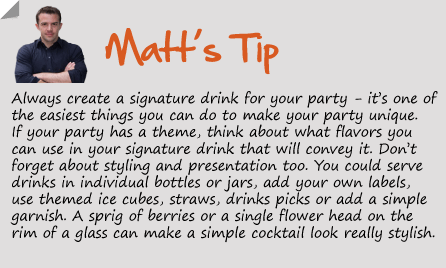 For inspiration you may also want to check out the photos on our Facebook page from when I used this theme for a party for The Red Cross (below). 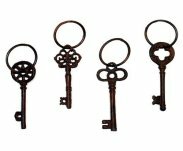 Grab your guest's imagination from the beginning by using ornate keys as the invitation (see below). 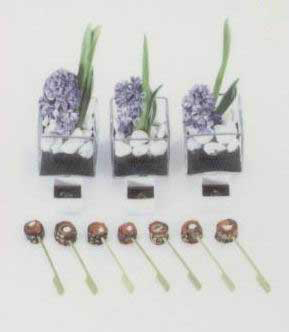 These will evoke a strong visual image of guests letting themselves into a hidden garden. 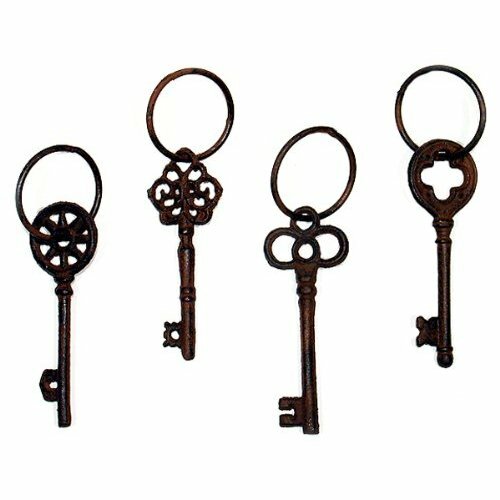 To make these, pick up some ornate keys (below left, USA only, UK visitors try here ) and attach a small tag with all the party details on (see examples at Using Tags on the Create Invitations page). 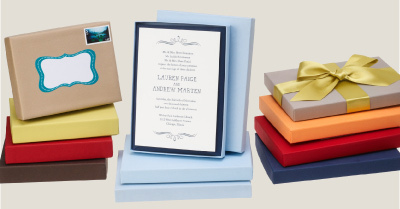 Either hand write the details onto a decorative shipping tag, or you can have these printed quite cheaply (approx $20 for 100 cards) incorporating your own photograph - see printed mini cards on the Create Invitations page. Spray a few drops of grass scented perfume onto the invitations before sending out in these cute box mailers (below right, USA only) - the smell of fresh cut grass greeting your guests when they open their invitations will really bring your these garden party ideas to life. Pear and Rosemary is a great combination for a refreshing summer cocktail so check out this recipe (right) from Martha Stewart. 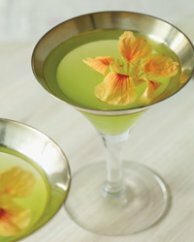 Similar combinations perfect for these garden ideas include this Apple and Sage Martini, and this Lemon and Basil Martini. This Lavender Martini recipe (right, from The Food Channel) has a lavender sugar rim which adds a lovely apperance to this delicate garden themed cocktail. 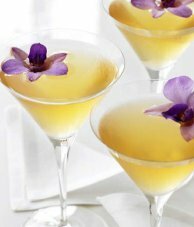 This recipe for a Butterfly Cocktail (right, from Staton Hall) uses basil, mint, Citron Vodka, Elderflower cordial and is garnished with an edible flower (I'd suggest a Pansie) so is a perfect cocktail for these garden party ideas. 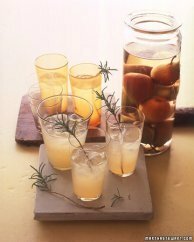 If you want to wow your guests with something really original try this Garden Elixir recipe (right, from Food and Wine) which combines cilantro with gin, apple juice, celery juice, lime, and Chartreuse. Think about what foods are in season and really try to capture the flavours of the garden by creating an earthy menu that uses lots of fresh herbs, fruits, vegetables, and edible flowers. 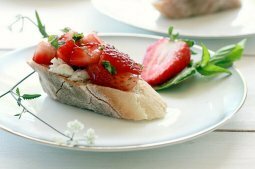 Try to make sure every dish incorporates at least one of these in a significant way and before you know it your menu will start to bring these garden party ideas to life. 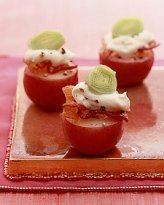 To give you an idea, below are some of the dishes I used for a similar party for The Red Cross (which actually took place in the fall). Note the 'on-theme' ingredients are highlighted in bold. 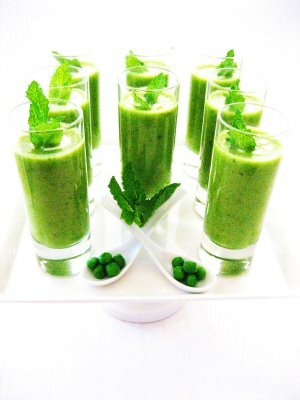 Chilled Pea and Mint Soup served in Shot Glasses. 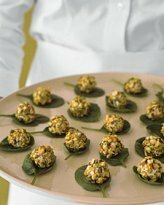 Cream of Pumpkin Soup with Crispy Sage served in a Baby Squash, Toasted Organic Seeds and Nuts to Sprinkle, with House Baked Breads. Warm Plum Crumble Tartlett with Orange Blossom and Nutmeg Ice Cream, Apple Wafers and an Individual Jug of Blackberry Coulis. 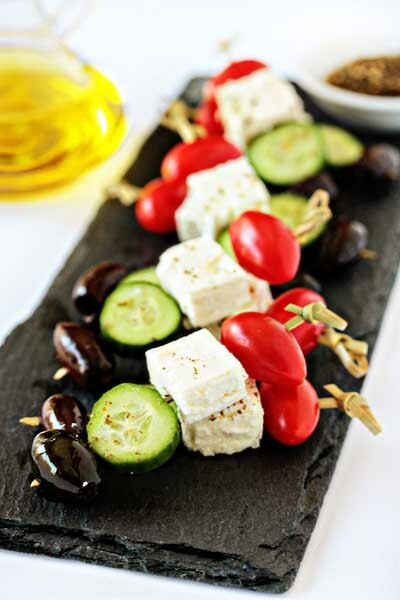 Obviously these dishes were created by a professional caterer, but hopefully it will give you some ideas for how you can embellish your own menu by including lots of natural, earthy ingredients and flavours. 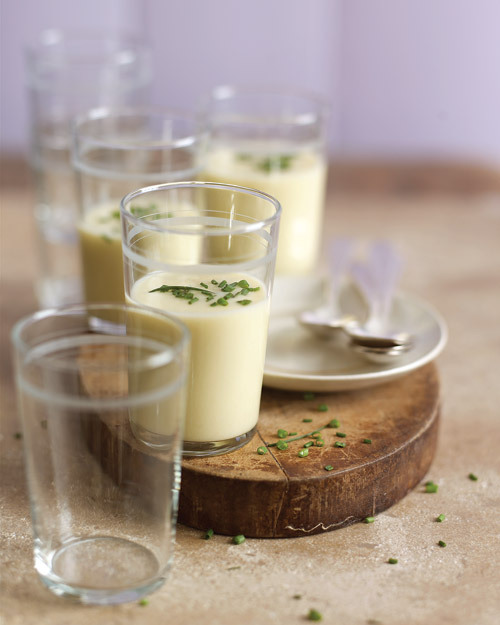 Chilled soups are great for a garden party theme and if you serve them in individual shot glasses they're easy to eat standing up—plus they look really cute. Check out this recipe for Chilled Pea and Mint Soup with Creme Fraiche (below left, from Modern Foodie), alternatively you could try this Chilled Potato Leek Soup (below right, by Martha Stewart). 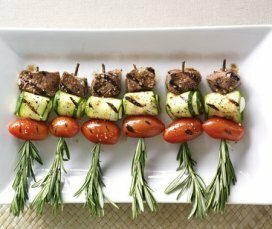 One of the appetizers we served for the Red Cross party was slices of lamb skewered on brached of rosemary. 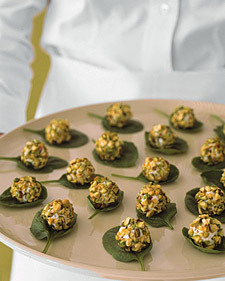 Here's a similar recipe (below left, by Canadian House and Home). 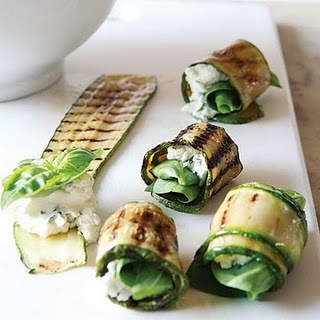 Likewise, here's a similar recipe to the Zucchini Roll Ups that we served (below right, from Health). 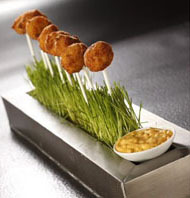 I love the trend of re-imagining salads as cocktail party appetizers by serving them on skewers. 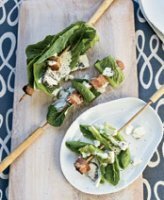 Here are a few for inspiration: Bacon and Romaine Skewers with Blue Cheese Dressing (below left, from Food and Wine), Greek Salad Skewers (below center, from My Baking Addiction), and Skewered Ceasar Salad (below right, from Chefs Resources). There's no recipe for the last one unfortunately but I just thought the idea was so cool and I suspect you could easily create something similar by slicing sections of romaine lettace lengthways, adding skewers, then putting the dressing, parmesan and shaved croutons on top. 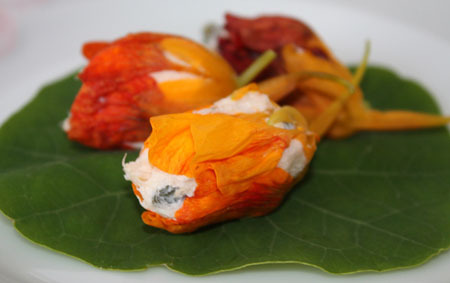 This type of party theme is a great excuse to serve some more unusual dishes such as ones that incorporate edible flowers. First I'd recomend you read this really informative article about edible flowers whichis a great introduction to how best to usethem, including a list of suitable flowers. 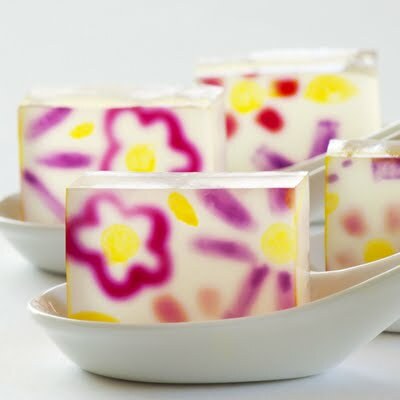 Then check out this extensive list of edible flower recipes which includes dishes such as Edible Flower Cream Cheese (right), Rose Petal Ice Cream, Chicken with Lavender and Honey, Salmon Pizza with Nasturtiums, Beef with Rose et Poivre, and even a Lavender Blueberry Soup! 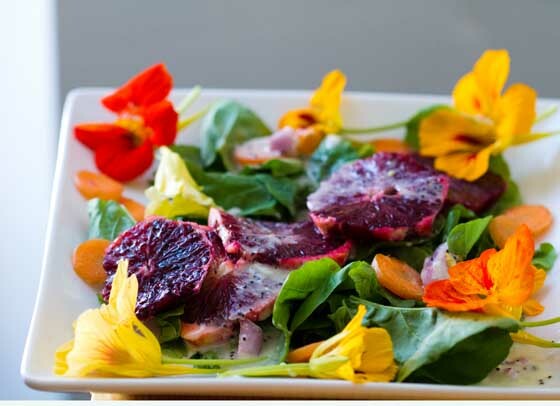 One other edible flower recipe I just had to include is this Goat Cheese, Asparague, and Beet Salad (below left, from Herbivouracious) because the presentation is stunning and it includes instructions for how to arrange it like this. 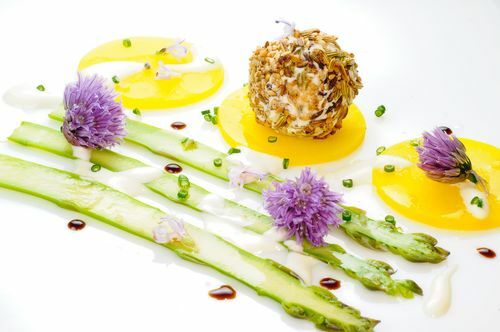 This dish uses chive flowers (the purple puffballs in the photo) and rosemary petals. 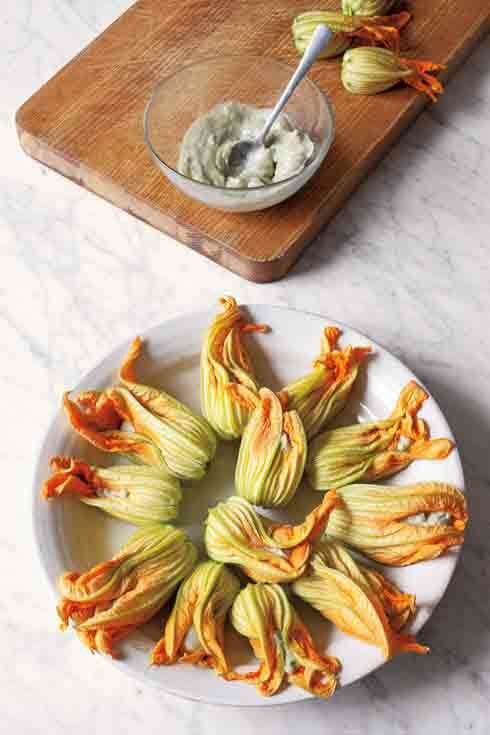 Finally, you can also try these Cheese Stuffed Zucchini Flowers (above right, from Panachemag) although I have to confess I really like these when they've been deep fried tempura style so here's an alternative recipe incase you want to try them this way. 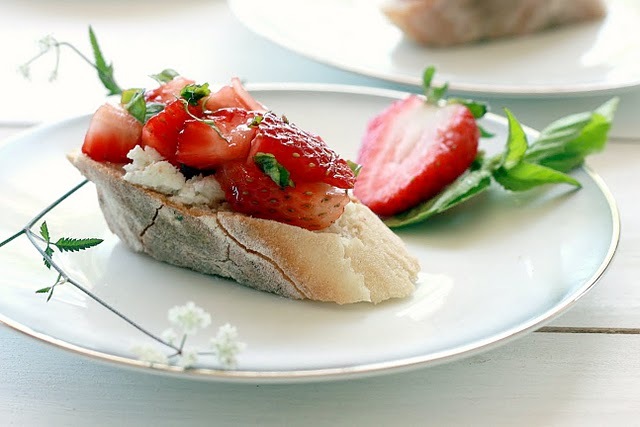 Bruschetta makes quick and easy party food and there are so many different options for toppings that you can easily find something to tie in with these garden party ideas. 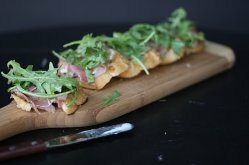 This Prosciutto, Marscapone and Honeyed Arugula Bruschetta (below right, from Food + Words) looks great, or for something a bit different try this Balsamic Strawberry, Basil, and Goat Cheese Bruschetta (below right, from Yummy Mummy Kitchen). Here are three other simple garden themed appetizer recipes, all of which can be prepared in advance and then assembled at the last minute. 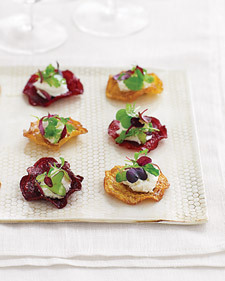 Goat Cheese and Pistachio Served on Baby Spinach Leaves (below left), Potatoes with Creme Fraiche and Bacon (below center), and Beet and Goat Cheese Hors d'Oeuvres (all three from Martha Stewart). 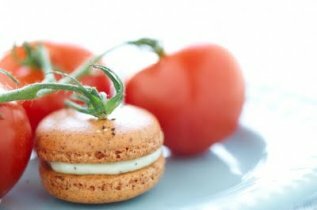 These Tomato Macaroons with Basil Buttercream (below left, from Double Cream Single Sugar) caught my eye as they just sound so unusual and that's what I think party food should be all about (who wants to be served the same old everyday food at a party?? Be adventurous! If you want 'safe' options you can go to a restaurant). 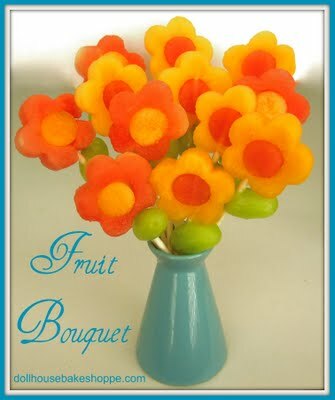 For something a bit more playful, try making Fruit Flower Pops (above right), by Lindsay Ann at Dollhouse Bake Shoppe) or see the video below for a demonstration of how to make Fruit Bouquets. 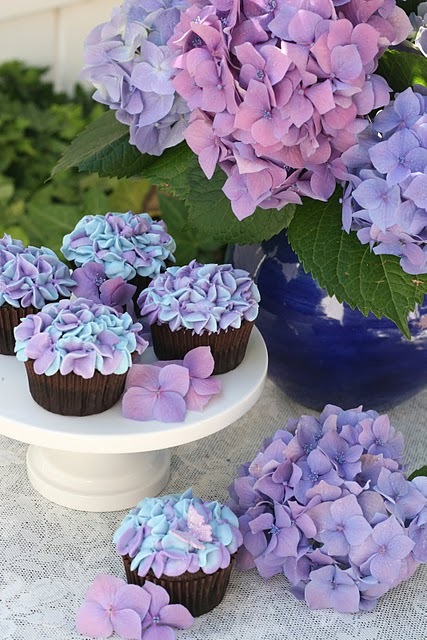 These Hydrangea Cupcakes (below left, from Glorious Treats) are so pretty, or for something really simple just fill meringues with whipped cream and blueberries and garnish with violets (below right, from Country Living). If you want to try something a bit more unusual, try making these cocktail jello shots (from the Jelly Shot Test Kitchen). 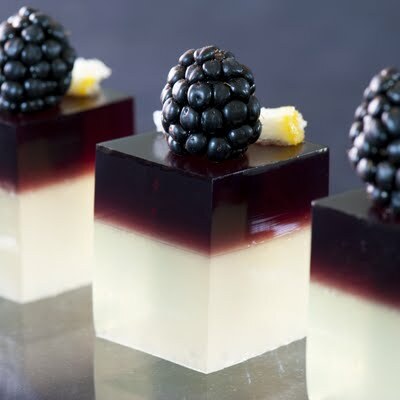 These three flavors The Bramble (below left), Cucumber Lime Margarita (below center), and Elderflower Mojito (below right) fit well with these garden party ideas. 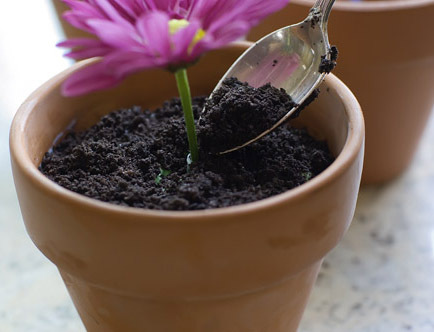 Finally, I love these Flower Pot Desserts (below, by Ree from Pioneer Woman) with are perfect for these garden party ideas. 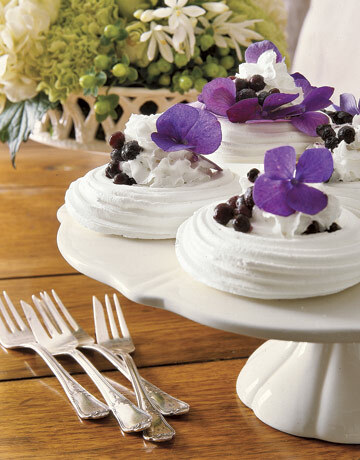 Keep trays and serving dishes as rustic and natural as possible by using lots of wood and decorate with leaves, petals, or flowers. 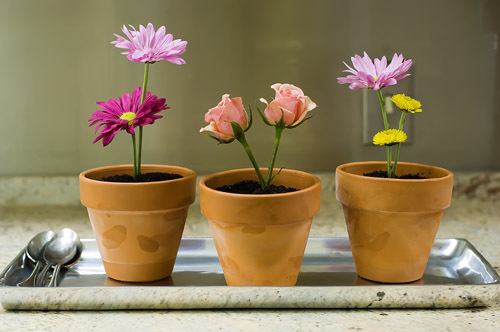 Browse your local garden centre for small planters, seed boxes, or terracotta flower pots to serve dishes in, or fill small glass cubes with flowers, grasses or decorative stones and position one on each serving tray for decoration. See the photos below created by one of the UK's top catering companies The Admirable Crichton for inspiration. 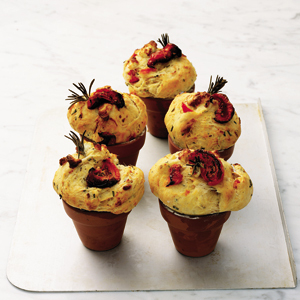 This recipe for Feta, Tomato and Rosemary Flowerpot Breads (below from Delicious Magazine) is a great example of how you can serve foods in terracotta pots. 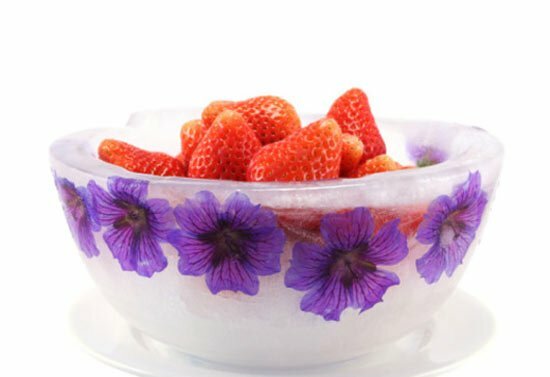 Freeze flowers (or fruit, such as berries) into ice cubes (below left, from Martha Stewart) to add to drinks, or serve food in ice bowls with flowers frozen in them (below right, from Food Network). 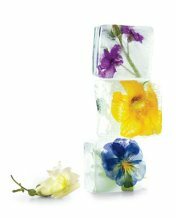 For step by step instructions on how to make ice bowls like these to incorporate into your garden party ideas, see the video below. 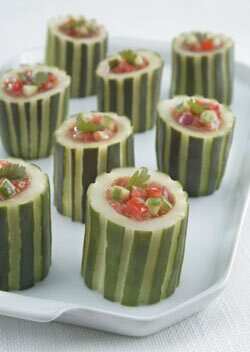 Think about what fruit and vegetables you can carve into cups and bowls to serve food in. 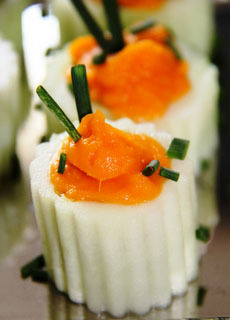 For example, I love serving pumpkin soup in hollowed out baby squash. 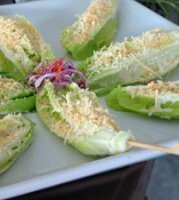 Below are a few different ideas for how to serve appetizers in cucumber cups which go really well with these garden party ideas. 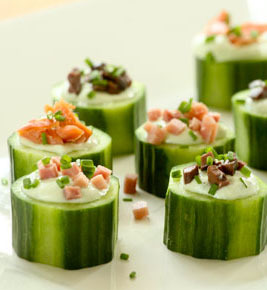 Spicy Gazpacho in Cucumber Cups (below left, from Viking), Cucumber Cups with Ginger Carrot Puree (below center, from Stranded in Cleveland), and Creamy Cucumber Chive Cups (below right, from Wholefoods). 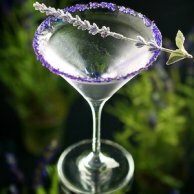 The trick to making cocktails look professional is to always add a garnish to decorate the glass. A simple spring of berries or slice of fruit on the side of a glass, or an edible flower such as a pansie, violet or rose petal can really enhance the appearance and make it look so much more special. 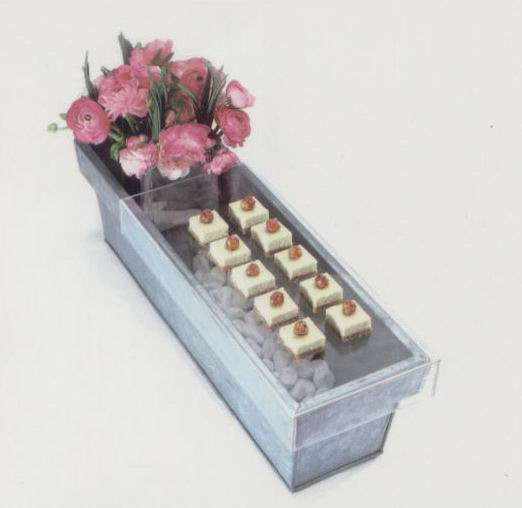 I always think it's important to make a feature of the buffet / dessert table. Creating a well styled food table acts as a focal point for all the garden party ideas and decorations. 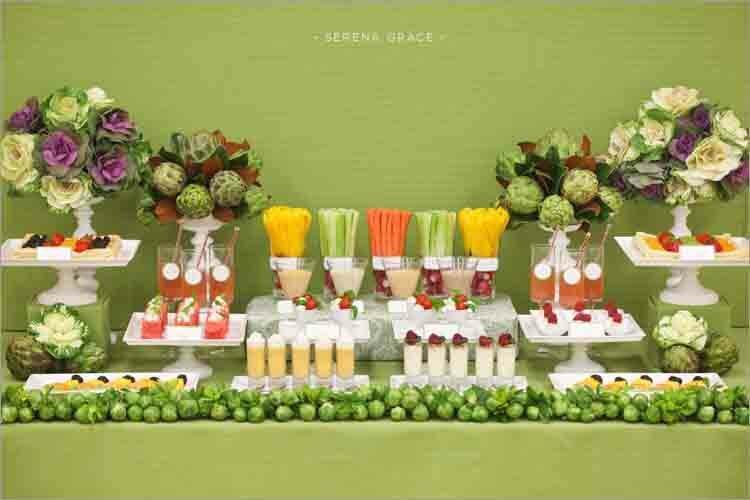 Check out this amazing veggie buffet table (below, from My Bride Story) for inspiration. 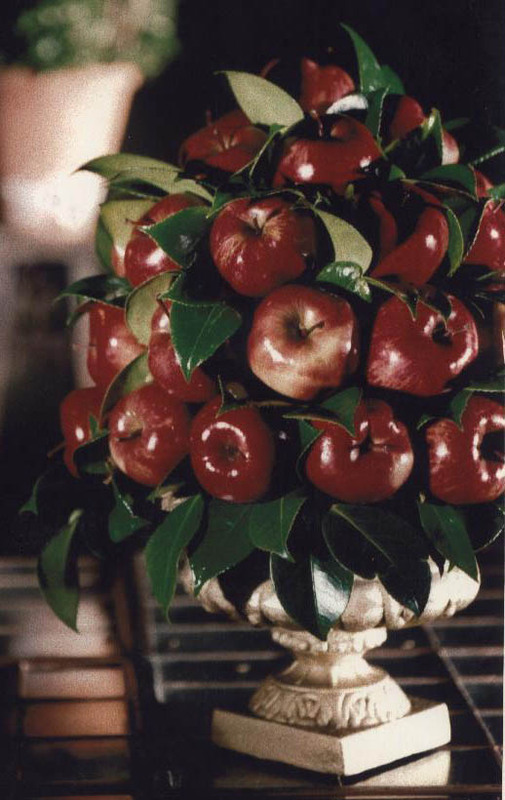 It just shows how easy it is to style a table just using fruit, vegetables, and a few flowers. 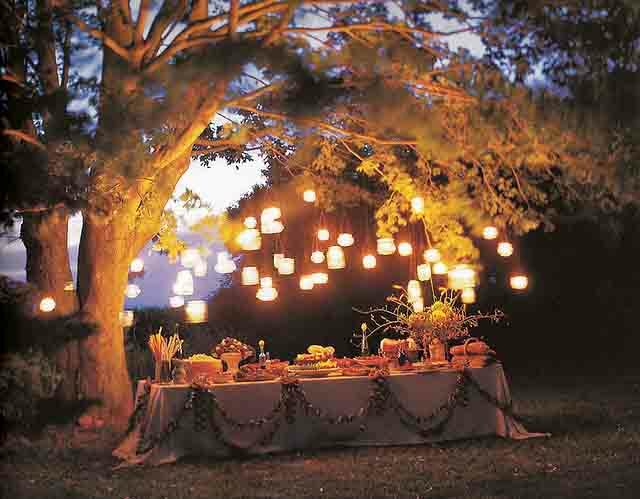 For decorations, lighting (below left) and table styling tips (below right) to compliment these garden party ideas, please see my separate Garden Party Decorations page. Were these garden party ideas helpful? If so, please take a minute to help me promote this page by clicking on the Facebook or Twitter buttons below. Or, if you have your own site / blog or you contribute to a relevant forum, click on 'Enjoy this page? 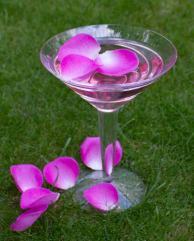 Please pay it forward' below to get the code to link directly to this page of garden party ideas.